The structure has only one tier and is used for storage purposes only. The number of persons likely to be on the floor at any one time is low and does not include members of the public. The floor is not more than 10m in length or width and does not exceed half the floor area of the space in which it is situated. The means of escape from the floor meets the relevant provisions in sections 3, 4 and 5. In the majority of cases the means of escape is to a 'place of safety' and is 25m in only one direction (1 staircase) or 45m in more than one direction (2 staircases). If the lower level is fitted with a smoke detection system the floor size can increase to not more than 20m in either width and length. These floor dimensions have been set to limit the distance a fire-fighter needs to travel over or under a floor and it is possible to vary these dimensions in some cases. Part M of the current Building Regulations covers access to and use of building and relates to the provision of disabled access. For raised storage platforms and mezzanine floors, the main reference is regarding the staircase.The type of staircase required will depend on the use of the mezzanine floor and the provision of reasonable access. Part M requires ambulant staircases that have wider stair treads, lower steps, in-filled risers and a mid landing depending on the height. If the storage platform is being used for the storage of heavy and bulky items that are handled manually it could be unreasonable to expect people with disabilities to carry out this work and if this is the case ambulant staircase may not be required. This would be determined by an access statement relating to your type of business. Part K 2013 of the current Building Regulations covers protection from falling and relates to the design of the staircases and barriers used on and around mezzanine floors and raised storage platforms. By using an EZR mezzanine floor you can be assured that the design will conform to Part K and its requirements. To download a full copy of Part K please click the icon below. Please click the icon below to download our Environment and Sustainability Policy. BS5454:2000 Document Storage makes recommendations for the storage of archival documents mainly concerning traditional materials, i.e. paper and parchment. The standard BS5454 for archive shelving systems is intended for use by archivists, librarians, conservators, museum curators, architects and designers. The key points for BS5454 Shelving are shown below and a full copy can be purchased from BSI. Shelving should be designed in such a way as to provide adequate ventilation, allowing free movement of air around the stock to ensure pockets of stale air or humidity do not pose a threat to the stored material. The lower shelf level should be at least 150mm from the ground. Shelving systems should have clear unobstructed apertures, ensuring that all shelf clips are concealed within the shelving structure and do not protrude through the frame to cause the snagging of valuable items. Shelf frames should not impede the clear aperture available for storage to avoid snagging or damage. Each shelf aperture should have a 50mm gap from the top of the stored material to the underside of the shelf above.Ideally, shelves should be easily adjustable on a 25mm pitch, to accommodate units of varying size and shape. The front edge of each shelf should be rounded or turned so that there is no sharp or angular edge to damage documents, injure people, or obstruct the withdrawal or replacement of documents. All shelves should have provision for labelling to clearly identify materials stored. Open frames are the preferred means of construction to ensure through flow of air. Solid side walls with perforations are suitable if loose items are to be stored. Solid back sheets to the shelving units should be avoided, although open-mesh back sheets are acceptable to allow the through flow of air. Lighting should be at least 300mm above the top of stored material, as exposure to light and heat can damage documents. For mobile shelving, there should be a minimum gap of 25mm between the mobile shelving runs, allowing (i) good air circulation; and (ii) fire suppression systems to effectively circulate gas in an emergency. When mobile bases close against one another, they should be designed in such a way as to ensure that all stock is contained within the shelving and not crushed by an adjacent mobile run. BS5454 states that methods of operation should predominately be mechanically or hand cranked systems to reduce any risk of fire associated with powered electric mobile systems. Push-lock handwheels should ideally be fitted to the operating end of the system to ensure personnel have the ability to lock off a run of shelving for access, without fear of harm from an adjacent mobile run closing the aisle. Anti-tip devices should be incorporated within the mobile base, where the height to depth ratio is greater than 5:1, to prevent any possible tipping of a shelving unit. Mobile shelving aisles should be no less than 750mm wide and a typical aisle would be 900mm to ensure there is adequate space to manoeuvre when accessing the lower shelf levels. Main gangways should be no less than 1100mm from the handwheel to an adjacent wall or obstruction, providing adequate means of escape in the event of a fire. 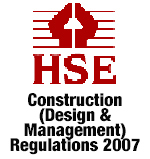 CDM Regulations were introduced by the Health & Safety Executive to reduce accidents and improve health and safety within the construction industry. The term 'construction' includes the installation of shelving, racking, partitioning systems and mezzanine floors and there are clear rules to determine if a project is notifiable. If the project will involve more than 500 person days of construction work. The project involves demolition or dismantling. A key element of CDM regulations is to demonstrate that risks have been considered and steps taken to minimise these risks to prevent injury to workers. In the unfortunate event of an accident or injury the HSE may request evidence that potential risks have been assessed. The relevant documentation, including risk assessments and method statements, should be contained within a health and safety file and this includes design drawings that should also show that potential risks have been 'designed out' where possible. The client must appoint a CDM co-ordinator to advise and assist you with your CDM duties and a Principal Contractor to plan, manage and co-ordinate the project. The client can be both CDM co-ordinator and a Principal Contractor provided they can have the necessary competency and resources. Even if the client delegates the CDM co-ordinator and Principal Contractor roles to other parties, the client is still responsible for Health and Safety on the site. Anyone undertaking a new project, or a refurbishment project, should be aware that it may be 'notifiable' under CDM Regulations. CDM 2007 is about choosing a competent team and helping them to work safely and efficiently together. E-Z-Rect can help you to comply with the CDM aspects of your job and if necessary help you to appoint a CDM co-ordinator to ensure that you are following the regulations. Further information can be found on the HSE Web Site. Please click the link below to download a copy of the safety test report for E-Z-RECT Mobile Shelving. 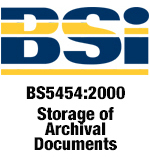 The new PD5454 archive storage guide replaces the previous BS5454:2000 standards for the storage of archive documents. The new guidelines take a fresh look at how archive materials should be stored and offers clear guidance on what materials should be used and how to maintain the optimum conditions for safe, long term storage. The storage equipment section details how archive storage systems should be designed and installed to offer the best protection for archival materials. A recommended figure of SPAN/200 is recommended for all archival shelves, an example shelf measuring 1000mm across the long edge would have a permissible deflection of 5mm. Due to the bespoke nature of mobile storage systems, each mobile installation should be designed around the specific needs of each individual site, documents of any shape or size should remain easily accessible. Mobile shelving should only be installed on floors that can safely support the whole structure and its potential load, considerations during the design stage should take into account any possible movement of the floor substructure. EZR Shelving provides high quality archive shelving systems that are compatible with the new PD5454 guidelines. To find out more please call 01993 779494. If your business provides equipment and/or machinery for use in the workplace then you will need to consider how safe they are to use. The Provision and Use of Work Equipment regulations 1998 (PUWER) provide important guidelines to ensure all employees, contractors and site visitors remain safe whilst using equipment at work. Download our brief guide to the PUWER regulations for a quick overview of what action you need to take, along with a link to the official HSE site.